On March 31, 2017 Congressman Beto O’Rourke, a Democrat from El Paso, announced his candidacy for US Senate, against incumbent Senator Ted Cruz, a Republican with the backing of President Donald Trump. The candidates’ polarized campaigns and policies echoes the stark divide in the politics of Texas, a state which houses Austin, the second best city to be a liberal, as well as Midland, the best city to be a conservative, according to SmartAsset. In 2016, Cruz ran for the Republican Presidential nomination and came in second, behind current President Donald Trump. O’Rourke and Cruz are on opposite ends of the political spectrum. Cruz advocates for a local control, lowering taxes, securing the borders, and is an ardent supporter of school choice, while O’Rourke supports a stronger federal government, ensuring retirement for teachers, creating universal health care, and instituting comprehensive immigration reform. Platforms for dialogue and disagreement was planned by the two candidates in a series of debates. O’Rourke suggested six debates, including two in Spanish, which Cruz amended to five debates, all in English with predetermined moderators and topics. O’Rourke agreed to the principal of the debates, but recommended edits on the times and topics. Ultimately, the two decided on three debates: on Sept. 21 in Dallas, Sept. 30 in Houston, and Oct. 16 in San Antonio. O’Rourke said his original request to hold two debates in Spanish was an attempt to recognize the 29 percent of Texans who speak Spanish. O’Rourke himself was born in the border city of El Paso and the issues of the minimum wage and immigration reform continue to be top priorities for Texan voters. Cruz is advocating for the EL CHAPO Act, which would use funds seized from drug lords along the southern border to pay for a border wall. “Build a wall” was a rallying cry for Trump’s presidential campaign, and is echoed by his supporters and many conservative politicians. Both candidates recognize the problems with Texas’ education system, but would go about resolving these issues in very different ways. Cruz advocates for school choice, saying that it gives students more opportunities and improves public schools, and opposes the Common Core standard, in favor of more local control. 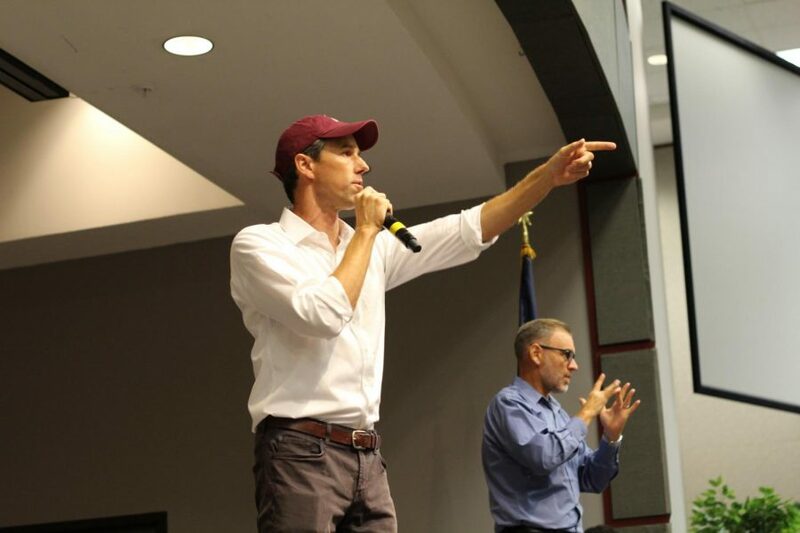 O’Rourke believes that the way to reform the education system is by increasing public funding to lower income areas, reducing the emphasis on high-stakes tests, and ensuring the retirements of teachers. At the start of his campaign, O’Rourke announced that he would not accept money from any Political Action Committee (PAC) or special interest group. This summer, the congressman raised $10.4 million over three months, compared to Cruz’s $4.6 million over the same time period. With a total of over $47 million raised between the two candidates, this Senate race is the most expensive Senate race in America, according to Fox News. The two candidates also differ on gun control. Ted Cruz is a supporter of the NRA and a co-sponsor of the Protecting Communities and Preserving the Second Amendment Act in the Senate, which sought to increase funding for school safety, create a federal task force to prevent illegally obtained firearms, and ensure that all convictions are reported to the National Background Check Database. This bill was originally introduced in 2013, and reintroduced March, 2018 by Cruz and Sen. Chuck Grassley R-Iowa, blocked by Senate Democrats both times. Cruz and Grassley believe that this bill could have prevented the Santa Fe shooting of May, 2018, and, if passed, would prevent future school shootings. The midterm elections will be held on Nov. 6, and Oct. 9 is the deadline to register to vote. According to Texas state law, at least twice a year each high school must offer an opportunity for students to register to vote. Closing LASA? Starting at nine?